An extremely attractive example of John Cary's important 1799 map of the Venetian States. 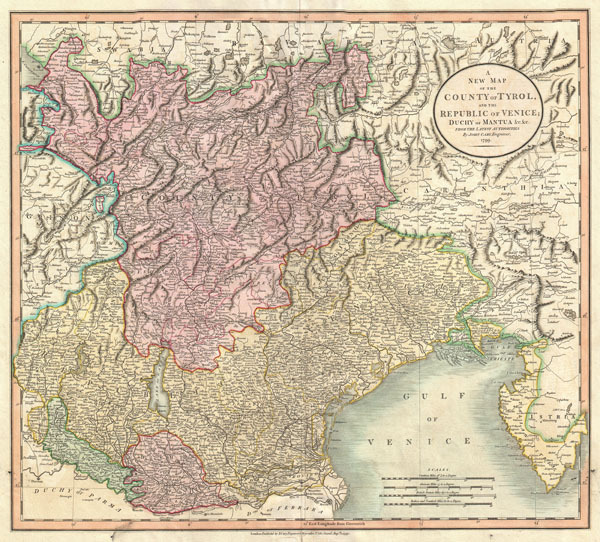 Covers Bergamo and Lake Constance eastward, past Tyrol, Venice, and Mantua to Istria and the Gulf of Trieste. Offers stupendous detail and color coding according to region. All in all, one of the most interesting and attractive atlas maps the Venice, Mantua and Tyrol to appear in first years of the 19th century. Prepared in 1799 by John Cary for issue in his magnificent 1808 New Universal Atlas. Very good condition. Minor verso repair and reinforcement on original centerfold. Blank on verso. Minor discoloration lower left border. Rumsey 1657.032. National Library of Australia, MAP Ra 84 Plate 30. Phillips (Atlases) 714. The Map Collector, issue 43, p. 40-47 (Atlas). National Maritime Museum, v. 3, no. 311.